£13.05 each & FREE Delivery in UK. 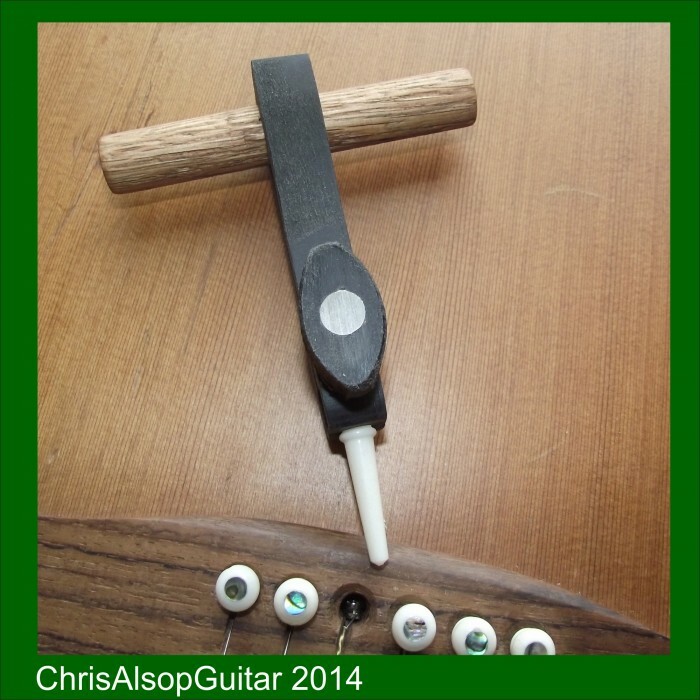 This is a pin puller made By Chris Alsop in his workshops in Woodville, Derbyshire, UK. • Avoiding any part of the tool touching the bridge wood and it will not scuff and bruise the bridge wood surface. • A secure mechanism that clamps the pin, by tightening a clamp bolt, which means the pin is pulled without the puller jaws slipping off. 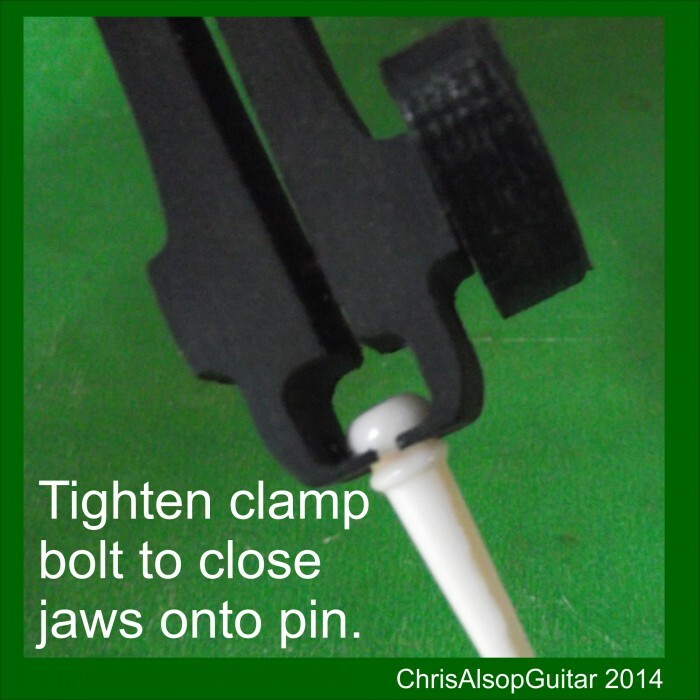 Achieving this has involved a simple design using a clamping jaw mechanism. The jaws need to be only 1mm thick to get into the recess below the pin head. To make such jaws strong enough has required the use of the high performance Engineering grade reinforced nylon. This is an incredibly strong plastic material, which is gentle on surfaces but also incredibly strong - its also used for things like tyre levers, levers for removing car trim and mini propellors. The result is a new design of pin puller , never seen on the market before, that works extremely well. This pin puller tool provides an efficient and easy to use solution to extracting bridge pins. 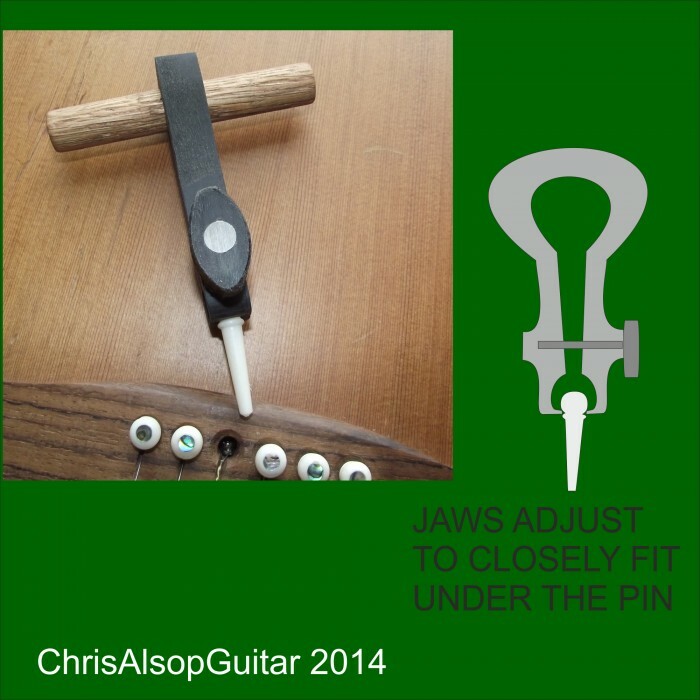 • The jaws are adjustable so when over the pin they can be tightened to ensure jaws fit on the pin - usually between the pin head and the pin skirt. • Made of incredibly strong glass reinforced nylon based material. 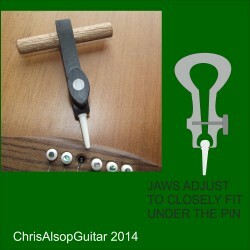 • Makes pin pulling easy - even for the most stubborn pins. 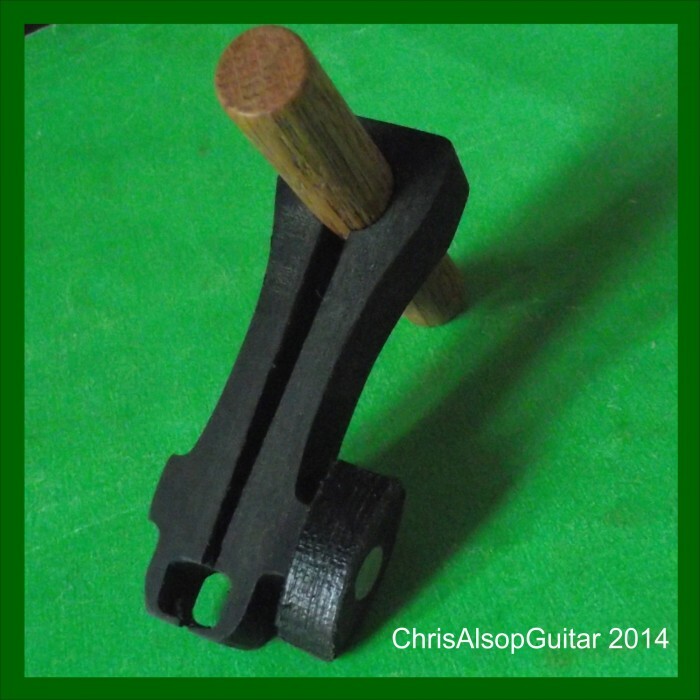 • No part of the puller has to touch the bridge wood, so minimises the risk of scuffing the surface of the guitar. 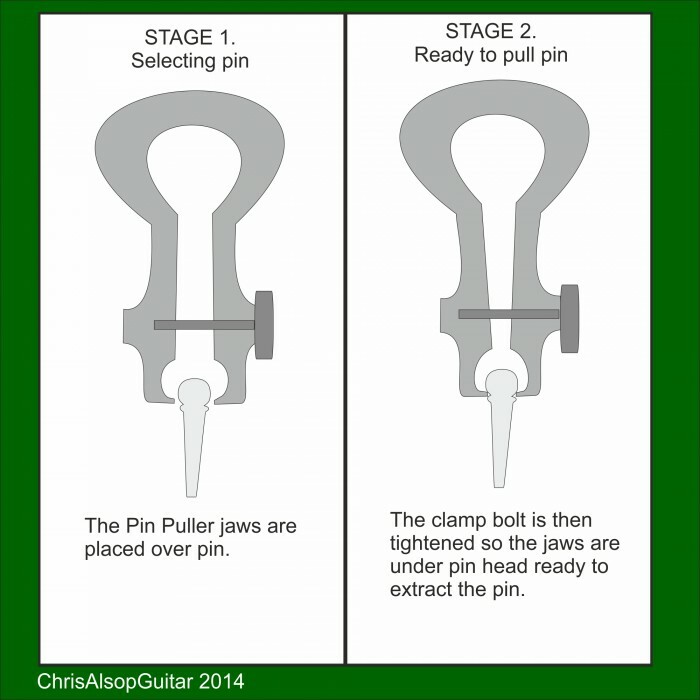 I make custom bridge pins and have always worried about how they are pulled from the guitar. I have designed and manufactured a pin puller that works extremely well. It has been tested on literally 100s of different pins and has succeeded in pulling all of them - no matter how firmly pushed into the pin slot they are. 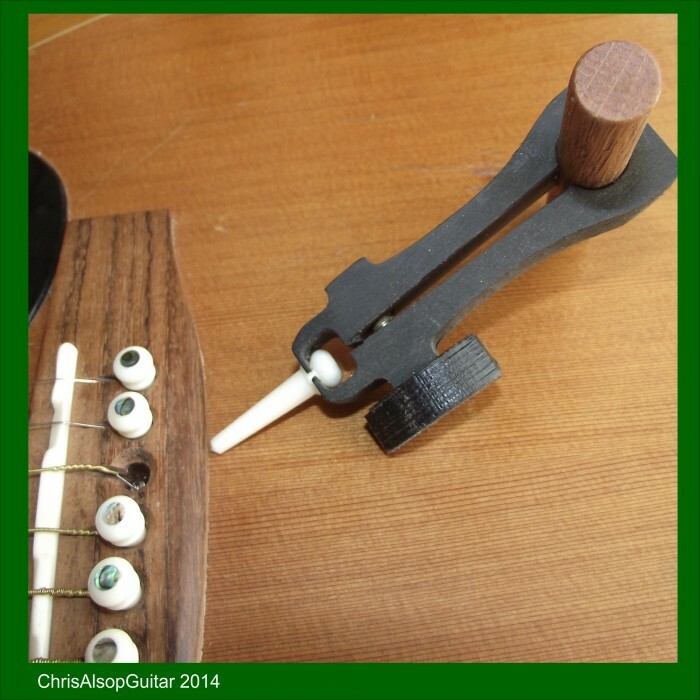 I now find changing strings a pleasure, with no worries about damaging the bridge wood or the pin.